World’s Fair Wednesday – Tomorrow-Land! 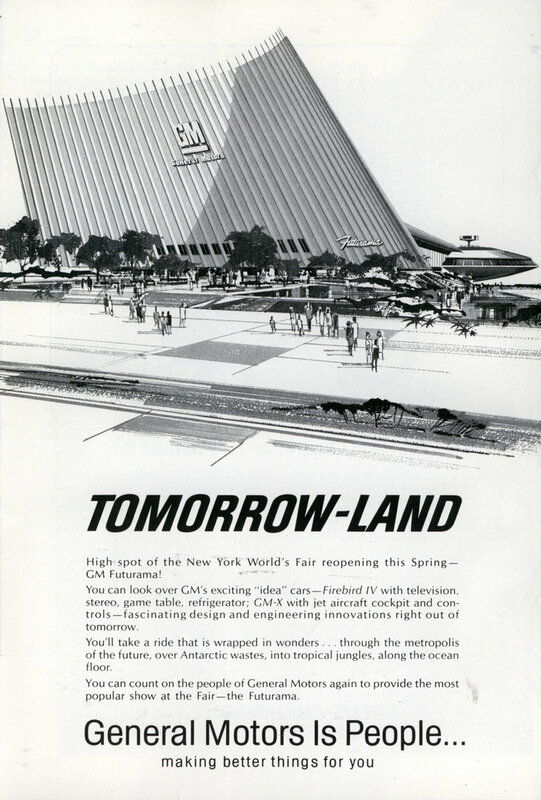 Here’s an ad for GM’s World Fair exhibit in 1965, Tomorrow-Land! Sound familiar? This exhibit hosted the Futurama ride posted about in last week’s Five Things. The exhibit’s architecture is obviously most striking here, but what really gets me is the layout and format of the ad – clean, simple….futuristic, almost. “Tomorrow-Land” in italics to suggest moving forward, oddly contrasted by the top of the GM building leaning the other way. Also don’t know if we ever got that Firebird with the television, stereo and game table, never mind the GM-X with the jet plane cockpit. Maybe I just missed those? It’s possible!